We ask of you: Are you our Master?note Clockwise from top: Darius III (Berserker), Ushiwakamaru/Young Minamoto no Yoshitsune (Rider), Arjuna (Archer), Dr. Jekyll (Assassin), Mash Kyrielight (Shielder), Altria Pendragon (Saber), Joan of Arc (Ruler), Mephistopheles (Caster), Altera (Saber) and Scáthach (Lancer). Not Pictured: The Two Hundred-Plus Other Servants. My Lord. Once more, I shall raise this flag, for this country's—-no, this world's salvation. Listen to my words, brave warriors gathered here, legion of brave heroic spirits! 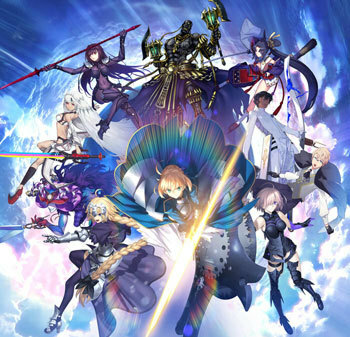 Fate/Grand Order is a mobile phone game entry in the massively popular Fate franchise with more than 16 million downloads for the Japanese version and 5 million downloads for the American version, developed jointly by Type-Moon and mobile company DelightWorks and published in cooperation with Aniplex, as part of the larger Nasuverse. It is a re-imagining of the original Fate/Apocrypha game project, before it became a novel series, and takes place in a somewhat alternate timeline to the main Fate/stay night game. As a result, characters from all over the Fate Series make an appearance here. It was released on Android on July 25 2015 and iOS during August of the same year. An English version was announced in April 2017 and launched in the United States on June 25, 2017. The game has also been released in China and South Korea. Buster: High damage cards that create few Crit stars but build no NP. Arts: Middle damage cards that build lots of NP but create no crit stars. Quick: Low damage cards that create lots of Crit Stars and build little NP. Other mechanics include Chains, whereby selecting three cards of the same category adds a new effect based on the selected card, Crit Stars that calculate your precentage for a Critical Hit, and your Noble Phantasm, a powerful Limit Break unique to every servant. The Chaldea Security Organization is a secret organization dedicated to the preservation of the human race. With the intellectual and financial resources of the world behind them, Chaldea has melded technology and magecraft into the creation of numerous tools to aid in their mission; most notably the Global Environmental Model "CHALDEAS", an omniscient and complete simulation of Earth's past, present and future. However, one day it suddenly becomes impossible to view more than one year into the future predicted by CHALDEAS, and the leaders of Chaldea conclude that humanity will soon face an impossible and unknown extinction event. Their researchers pinpoint the cause to a distortion within the space-time continuum, located in the Japanese city of Fuyuki in the year 2004. Chaldea gathers a number of candidates capable of using the Guardian Heroic Spirit Summoning System "FATE", a system that summons and weaponizes the legends of great historical, mythological and fictional figures as "Servants". Their mission is to go into the past and stop the space-time distortion at its source by utilizing an experimental form of Time Travel developed by Chaldea, with the aid of FATE and their Servants. Yet the secret lying within Fuyuki in the year 2004 is only the first step in a new Grand Order that sees you travelling across time and space, teaming up with (and against) the living legends of human history to fix the distortions warping the events of the past, and save the future. First Singularity: AD 1431 - Hundred Years' War of the Evil Dragons - Orleans - "The Holy Maiden Savior"
Chaldea arrives in France during the Hundred Years War, only to find the nation on the verge of defeat against an army of dragons led by an insane blackguard called "Jeanne d'Arc". They must join forces with the real Jeanne d'Arc and unite the country before it is wiped out. Second Singularity: AD 0060 - Eternal Madness Empire - Septem - "Emperor of Roses"
Taking place during the second half of the Roman Empire's rule in the Mediterranean, Chaldea works with the Fifth Emperor Nero Claudius to save Rome from a deluge of madness sweeping the countryside. Third Singularity: AD 1573 - Sealed Ends of the Four Seas - Okeanos - "Voyager of the Storm"
Joining forces with the legendary privateer Francis Drake, Chaldea embarks on a treasure hunt for the Holy Grail on an Atlantic Ocean that has been transformed into an endless seascape, making it impossible to achieve the circumnavigation of Earth. Fourth Singularity: AD 1888 - The Mist City - London - "Londinium Knight"
Chaldea arrives in London during the Second Industrial Revolution, discovering that the entire city has been choked by a poisonous fog inhabited by mechanical sentinels. Assisting their search for the truth is Mordred, the infamous Knight of Betrayal most known for killing his father, King Arthur. Fifth Singularity: AD 1783 - North American Myth War - E Pluribus Unum - "Steel Robes"
The American War of Independence has been thrown off-course by the arrival of an endless army of Celts. In response, the American armies have begun fielding mass-produced troops from another time era. Chaldea joins forces with the headstrong nurse Nightingale to stop the war at its roots: American President Thomas Edison; and the Celtic Queen Medb and her "perfect king", Cu Chulainn. Sixth Singularity: AD 1273 - Divine Realm of the Round Table - Camelot - "Shining Airgetlám"
Chaldea's journey to Jerusalem in the 13th century takes an unexpected turn when they find a world so diverged from human history that it threatens to tear away from the fabric of reality itself. At the centre of this apocalyptic landscape lies a shining walled "utopia" of Camelot, ruled by the Knights of the Round Table and their god-like monarch, King Arthur. Seventh Singularity: BC 2655 - Absolute Demonic Front - Babylonia - "The Chain of Heaven"
At the dawn of human civilization in Babylonia, Chaldea allies with a calmer and wiser version of Gilgamesh to save his kingdom from a seemingly never-ending tide of demonic horrors and vengeful goddesses. Final Singularity - AD 201Xnote the year depends on which version of the game you're playing: The Grand Temple of Time - Solomon - "The Divine Zenith Meteor Shower"
With the past, present and future of humanity at stake, Chaldea fights in its Darkest Hour against the mastermind of the seven Singularities. An interim storyline/mini-expansion, titled Epic of Remnant, bridging part one of the game (the singularities & the fight against their creator) with the proper part two was announced on New Year's Day 2017, and went live later that year. Pseudo-Singularity I: AD 1999 - Quarantined Territory of Malice - Shinjuku - "Shinjuku Phantom Incident"
Set in a corrupted version of the Japanese district of Shinjuku, the protagonist must ally with several Anti-Hero figures in a dangerous game, assisted by an amnesiac Archer that appears in the form of an old man as the sinister Phantasmal Fiend Alliance puts their plans in action. Pseudo-Singularity Extra: AD 2030 - Deep-Sea Cyber-Nirvana - "SE.RA.PH"
A bonus story where a far-off oil rig seems to have been transported to twenty years in the future - and into the Mariana Trench. A suspicious AI claims she can assist Chaldea to rayshift there but interferes with the process and welcomes the protagonist to SE.RA.PH, a digital world where the strong eliminate the weak. Pseudo-Singularity II: AD 2000 - Subterranean Folklore Realm - Agartha - "Women of Agartha"
A mysterious underground world consisting of several different fantastical cities has appeared underneath the Earth's surface and it's up to Chaldea to infiltrate it. Pseudo-Singularity III (Subcategory Parallel World): AD 1639 - Stage of Carnage - Shimosa Province - "Seven Duels of Swordmasters"
The protagonist dreams of an alternate reality where the Japanese province of Shimosa has fallen under a tide of bloodshed. The protagonist's only way out is through several duels with crazed Japanese warriors and their only help is Miyamoto Musashi, a legendary swords...woman? Pseudo-Singularity IV: AD 1692 - Forbidden Garden of Descent - Salem - "Heretical Salem"
An impenetrable black expanse has emerged in Massachusetts with the legendary Salem witch hunts awaiting inside; the protagonist must survive its horrific violence and learn the secrets of Abigail Williams, a young girl who seemingly has ties to powers far beyond her comprehension. The second storyline of Fate/Grand Order, Cosmos in the Lostbelt, officially launched on December 26, 2017. Set three years after the events of Observer on Timeless Temple, the destruction of the Singularities has set the stage for a new and powerful enemy to make its move upon Earth. The forces of those from the vanquished timelines of human history, where incorrect choices were made and requisite conditions were not met, have emerged from the gaps of the cosmos to seize what was denied to them. Heading this force are the Crypters: a group of seven elite Chaldea Master candidates who vanished under mysterious circumstances from the observatory. They quickly isolate Earth from the rest of time and space, and transform it into a blank slate upon which their new timeline can be built, erasing the Pan-Human History from which all timelines are derived. Within this empty world lie seven "Lostbelts": prototypical versions of Earth based on the lost possibilities of human history, each controlled and nurtured by one of the Crypters. Now the seven Crypters are competing against each other to see who can expand their Lostbelt the furthest and win the right to have their ideal world become the new reality. The only hope for humanity lies with the remaining heroes of Chaldea, who manage to escape on a cool Base on Wheels, and now, must infiltrate and destroy the Lostbelts before the Earth is completely consumed. Note that all Lostbelts take place in the present day; the year refers to when the Lostbelt diverged from the normal (Pan-Human) history. "Difference Depth" refers to the degree to which the Lostbelt differs from Pan-Human History, with higher grades indicating greater divergence; meaning greater threat to the normal reality. Lostbelt No. 1: AD 1570? - Eternal Frozen Empire: Anastasia - "The Princess of the Land of Beasts"
Three months after the assault on Chaldea, the protagonists trace their only lead to a Lostbelt in Russia, finding a world locked in permanent winter and inhabited solely by wolf people. There, they hope to confront the one responsible for attacking Chaldea: the "lost princess" Anastasia and her endless army of Oprichniki. Lostbelt No. 2: BC 1000? - Endless Century Of Ice And Fire: Götterdämmerung - "The Jolly Fellow of the Unquenchable Flame"
Chaldea receives a transmission instructing them to find the Beldanders, who belong to the "Wandering Sea" organisation: one of the three pillars of Magus society and the most elusive, as they have long sequestered themselves on a floating island where they devoutly study the Age of Gods. As Chaldea arrives in Sweden, they are enveloped in a Lostbelt where the events of Ragnarok have created a world in which humanity survives as mere cattle for the Giants by the command of Skadi and her Valkyries. Lostbelt No. 3: BC 210? - Land of Unified Knowledge: S.I.N. (Synchronized Intellect Nation) - "The Crimson Beauty Under the Moon"
Chaldea falls victim to an assassination attempt and a poison that does not exist in the present day. Their search for a cure leads them to the Lostbelt in China: a world of vast rice fields where peace has reigned for centuries, and strife, sadness, and cruelty are unknown to its inhabitants. Lostbelt No. 4: [????] 11900 - Samsara of Creation and Destruction: Yuga Kshetra - "The Final Ebony God"
Lostbelt No. 5: BC 12000? - Interstellar City Mountain: [????] - "The Day God (The Gods) Is (Are) Shot Down"
Lostbelt No. 6: AD 500? - Round Table Territory: [????] - "The Day A Star Is Born"
Lostbelt No. 7: BC [????] - [????] Sea of Trees: [????] - "[????]" An anime adaptation, Fate/Grand Order -First Order-, produced by Lay-duce, featuring the male protagonist and Mash as main characters, premiered December 31, 2016. It also went up on Crunchyroll the same day for U.S. viewers and on AnimeLab for those in Australia and New Zealand on January 1, 2017. Aniplex USA has licensed and produced an English dub for it. More anime was released a year later with a crossover special with Fate/school life done by ufotable and an original OVA written by Nasu, Fate/Grand Order -Moonlight/Lost Room-, done by Lay-duce. For the game's third anniversary in 2018, a TV anime series adaptation of the Babylonia chapter called Fate/Grand Order - Absolute Demonic Front: Babylonia by CloverWorks, a sub-studio of A-1 Pictures, and a two-part anime movie adaptation of the Camelot chapter called Fate/Grand Order -Divine Realm of the Round Table: Camelot- by Production I.G were announced, with Babylonia to air in October 2019, and the first part of Camelot, Wandering; Agateram, released in 2020. A musical stage adaptation of the Camelot chapter, Fate/Grand Order -The Stage-: Territory of the Holy Round Table - Camelot - Replica;Airgetlám, was announced in April 2017 and ran in Tokyo from July 14 to July 17, with performances featuring either the male or female protagonist. A musical stage adaptation of the Babylonia chapter, Fate/Grand Order -The Stage-: Order VII - The Absolute Frontline in the War Against the Demonic Beasts - Babylonia, was announced in October 2018 for two runs in 2019, first in Osaka from January 11 to January 14, then in Tokyo from January 19 to January 27, again featuring either the male or female protagonist in a performance. Two different manga adaptations of Observer on Timeless Temple have been released, -mortalis:stella- and -turas:realta-, featuring the male protagonist. Each manga alternates between different Singularities, with the former focusing on chapters two, four, and six and the latter focusing on chapters three, five, and seven. Each part of Epic of Remnant has its own manga adaptation, with I and II featuring the male protagonist and III and IV the female protagonist, the first manga adaptations to do so outside Learning with Manga. The manga adaptation focusing on the CCC crossover portion of EoR, featuring the male protagonist, released alongside the event's rerun in February 2019. There are also several official manga anthology series and single-volume anthologies. Kodansha Comics has licensed -mortalis:stella- for English release in Fall 2019. There is an online gag manga, Learning with Manga! FGO, which is ostensibly about teaching new players the ropes of the game but is mostly about the female protagonist's hijinks and poking fun at the game. It can be read here . A 15-minute anime adaptation aired on December 31, 2018 as part of the "Fate Project New Years Eve TV Special". There is also Fate/Gudaguda Order, a comic strip made to promote the game before release by keikenchi, known to Type-Moon fans for his work in Koha-Ace. It can be read here . Another online manga is Oshite FGO! Ijin to Shinwa no Grand Order (English: Teach Us FGO! Great Men and Myths of Grand Order), which features the male protagonist learning about the real-world stories and histories behind various Servants. The original comics can be found here ; unlike the other webcomics, there's no official English translation. An arcade game developed by Sega, Fate/Grand Order Arcade , was announced in July 2017 for Japanese Arcades, and came out a year later in July 2018. A board game, Fate/Grand Order Duel, was announced in March 2018 and came out in August. There is a Duel manga featuring the female protagonist.